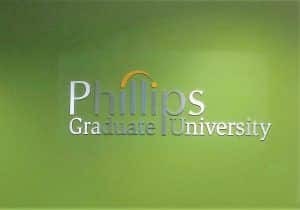 In our previous blog, I went over how we assisted Phillips Graduate University with updating their building signage by creating two front-lit channel letter signs. Since they are now a University, we want to help them make the public aware of their accreditation. Although the main change was switching the word “Institute” to “University”, they also decided to do a slight font change so we made them a completely new lobby sign. The new typeface also helps condense the letters a little since the school name is a little longer. After an overall site survey, we came back to remove the existing wall sign. Since this would inevitably leave damage to the drywall, we came ready to patch and paint the area. After giving the paint time to dry, we came back to install the new lobby sign. Having a colorful wall can be tricky when designing a lobby sign. You don’t want to incorporate any colors that would clash or not contrast well with the wall color and its surroundings. This was thought out early on as you can see because their wall is already painted one of the school colors. This gives them the ability to have aluminum dimensional letters that will stand out, look professional, and stay true to the school colors with the yellow logo. The lobby or reception area is the first part of the interior that a potential new student sees so you want to make sure that it makes a good impression. The immediate representation of the school colors show the school’s pride and a polished wall sign supports the credibility and professionalism of the school. To make this lobby sign we started with routing out each letter from 1/4″ aluminum. The logo was painted and the letters have brushed faces. The letters were mounted flush to the wall and as you can see from the photo, the thickness of the dimensional letters create a very dramatic effect when looking at it up close. The thicker the material, the more shadow it creates which increases the visual appeal. The brushed aluminum stands out great against the green wall and the sign looks great in the lobby area. 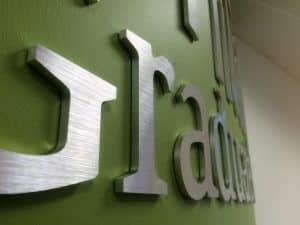 Check out the galleries on our website to see other aluminum dimensional letter signs we have made with brushed faces and painted faces. If you would like a wall sign made for your lobby or reception area, you can request a quote here.